Surpass the boundaries of continuous forms processing whilst improving the flexibility, accuracy and reliability. The Spedo UK 9400 web buffer surpasses the boundaries of continuous forms processing whilst improving the flexibility, accuracy and reliability demand by today’s applications. 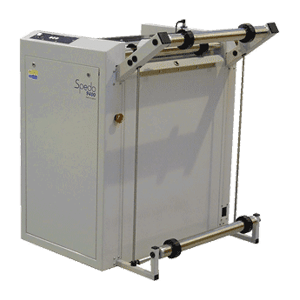 The Spedo 9400 uses the latest generation of Spedo’s well proven control system. This system has now been refined and expanded to provide spare capacity for the users every need. Our new web buffer will take control of your high speed printer and cutter to ensure the smoothest print flow possible.